A wool dress to keep me warm | Outfit - Do You Speak Gossip?Do You Speak Gossip? 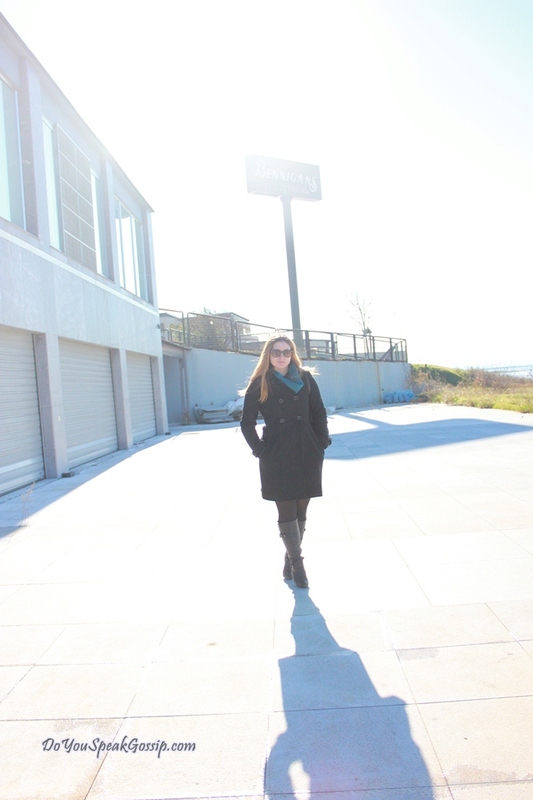 Coat: Pepe Jeans, wool dress: local store (old), bag: Penny Black, boots: local store (Largenti), sunglasses: Ray-Ban folding wayfarers. I took my coat off only for a few minutes, just to take these photos, and show you my dress, and then I put it back on, because it was freezing cold outside. The boots are my shoe save #38 according to the rules of Shoeper Shoe Challenge by Shoeperwoman.com. As I told you on my last post, I have dyed my hair red, so this is the last outfit post in which you’re seeing me with my old blonde hair. I already miss them so much. See you all soon….I’ll be here to wish you Merry Christmas next week, but in case you don’t see it, I hope you all have Happy Holidays. A whole dress is always a good idea and a stilished one!! !looking good my dear! XRONIA POLLA kai na peraseis iperoxa me to kalo sou & oikogeneia!! vanda recently posted..Ain’t no Kate…..
S’eyxaristw poli Vanda mou! Na’sai kala! Kai esi euxomai na exeis kales giortes me tin oikogeneia sou! Oh yes! So chic and warm! Love the color of your dress! Κουκλιτσα και πάλι! Τί ωραίο χρώμα; Σου ανοιγεί την ψυχή πραγματικά… Εγώ απλά δεν θα το φόραγα με ζώνη στη μέση. Αλλά μικρό το κακό. Μου άρεσε πολύ. Φιλάκια πολλά και καλές γιορτές! Μη ξεχνάτε τον ΔΙΑΓΩΝΙΣΜΟ μας! Πάρτε μέρος τώρα! Looking amaaaazing as usual! Can’t wait to see the new color! But this color now is amazing, I love that turquoise nuance – and the coat and boots too, all very elegant as usual! I’m feeling a bit better, just a bit, but at least better… and look, I just voted! Best Greek Beauty Bloggers Blog Competition 2012! I hope you win! Please send my greetings to T., I forgot about his birthday, sorry! I’m sure you had a lovely day! Now I saw that I hadn’t replied to many comments on my blog, including yours. Thank you so much again! And thank you for voting for my blog on the competition! i love sweater dresses…have a couple, but they are too warm to wear here! sounds like a nice dinner you guys have. i agree time spent together is far better than any gift. Indeed, especially now that times are difficult with the economic crisis. I hope you have a lovely time tonight. Merry Christmas to you and your family! Thank you so much for your kind, and encouraging words. I’m so glad you liked my blog and its content. I’d be happy to see you around again in the future. I’ll pass by your blog too, as soon as possible. Marloes recently posted..Outfit: Party time! Thank you so much Marloes! Το αγαπημένο μου χρώμα έχει το φορεματάκι σου το οποίο σου πάει πάρα πολύ και σίγουρα με το νέο σου μαλλάκι θα σου πηγαίνει ακόμα περισσότερο!Υπέροχο επίσης και το παλτό σου.